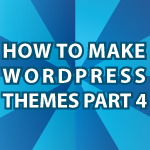 In this part of the WordPress Theme Tutorial I show you all of the HTML that is needed to create a WordPress Theme. If you don’t know anything about the above subjects you can click the link that applies to learn more about them. Here is also a link to the HTML Validator. Leave any questions and comments below.